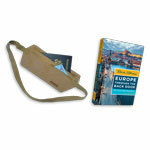 - Europe Planning map - Printed on tough, water-resistant paper, this map is perfect for pre-trip planning. Designed by travelers, it includes freeways and main train lines, plus eight city-center maps on the reverse side. Packed with lessons gleaned from over 30 years of budget travel, Rick answers the questions you have now — and those you wouldn't have asked until faced with them on your trip. You'll get Rick's latest tips for finding cheap airfares online, using your smartphone in Europe, top mobile travel apps, digital maps and navigation, using social media, and calling over the internet. 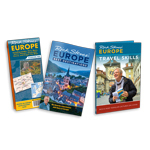 You'll also find Rick's trusted, step-by-step advice on packing, itinerary planning, budgeting your time and money, ATMs, credit cards, phones, internet, languages, eating, sleeping, sightseeing, safety, staying healthy, traveling with kids, and getting around Europe by car, train and air. In a special section, Rick gives a country-by-country rundown of his favorite destinations throughout Europe. Made from ultra-soft polyester blend fabric, our sturdy, ultra-light, under-the-pants Civita Moneybelt is your best guarantee against pickpocket theft. Join host Rick Steves as he experiences the local culture, cuisine, and fun in some of Europe's most interesting places: Italy (Siena, Assisi, and Tuscany's wine country), England (Cotswold villages, Wells, Stonehenge, and the southern coast), Germany (Dresden, Leipzig, Hamburg, Nürnberg, and Frankfurt), and some exotic eastern adventures in Bulgaria and Romania.